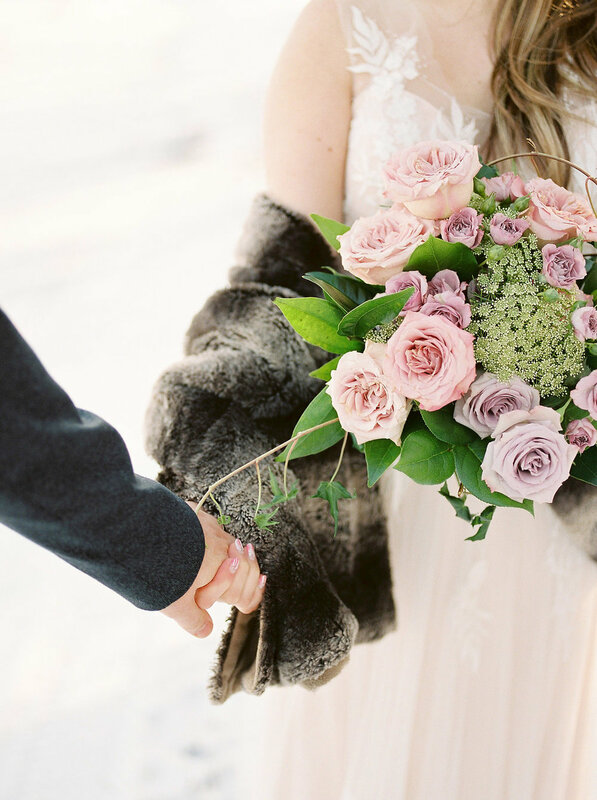 So now that spring is on the horizon, shouldn't I finally post this winter wedding inspiration at Whitetail Meadow? ha! I LOVE being a part of venue open houses - it gives me a chance to get creative and envision the space differently than it's been used for weddings so far. If you follow my work, you'll know that one thing that's really important to me in my designs is creating something that's different than what your friends have had for their weddings. However, when you're working at a brand new space, you're not hampered by anything! Such was the case for the open house I recently got to design for at Whitetail Meadow, a brand new venue open just outside of Niverville. If you are in search of a location for your wedding, make sure you put Whitetail Meadow on your list. The structure is a refurbished barn, so it can accommodate weddings at any time of year. They did a beautiful job on the renovation, with hardwood floors, a stone fireplace, and a loft space. 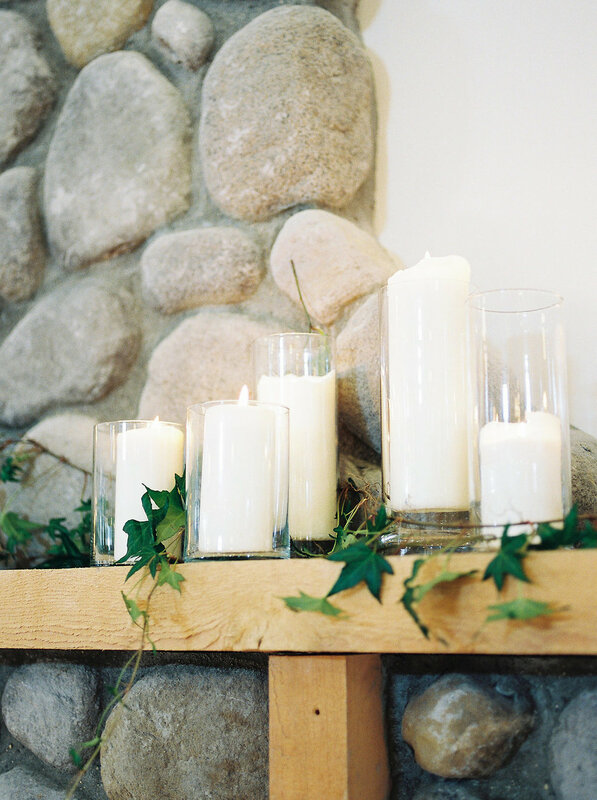 Ceremonies can be held on the adjoining veranda, in the meadow out back, or near a small creek, so you can really have whatever kind of setting you'd like! I'd love to do a winter wedding here with the ceremony taking place on the staircase landing, and just covering the staircase with greenery and flowers. I can dream! 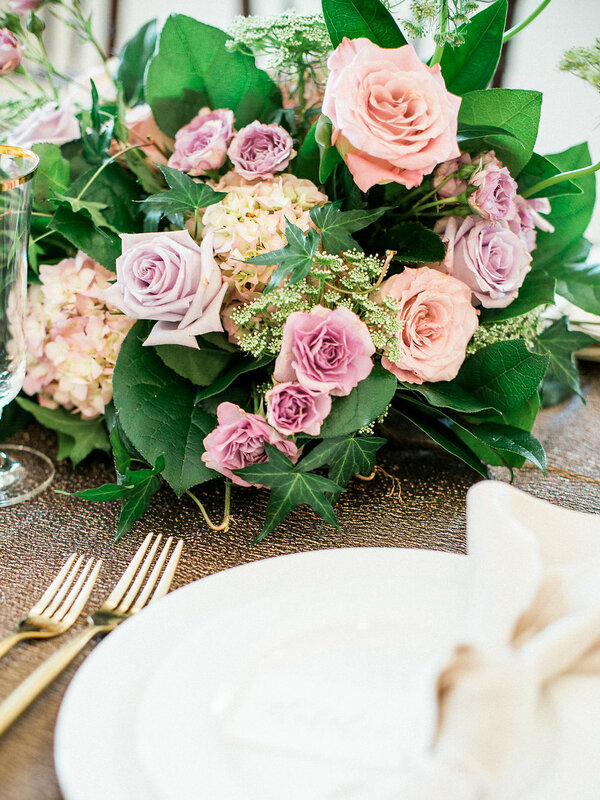 For the open house, we designed a romantic winter wedding setting, featuring a palette of pastel pink, purple, and copper hues. We borrowed this invitation suite from Jennifer Bianca Calligraphy. It was actually designed for a different couple's real wedding, but it worked so flawlessly with this design as well! I love the difference that a little colour makes. Those soft pink envelopes are just perfect. 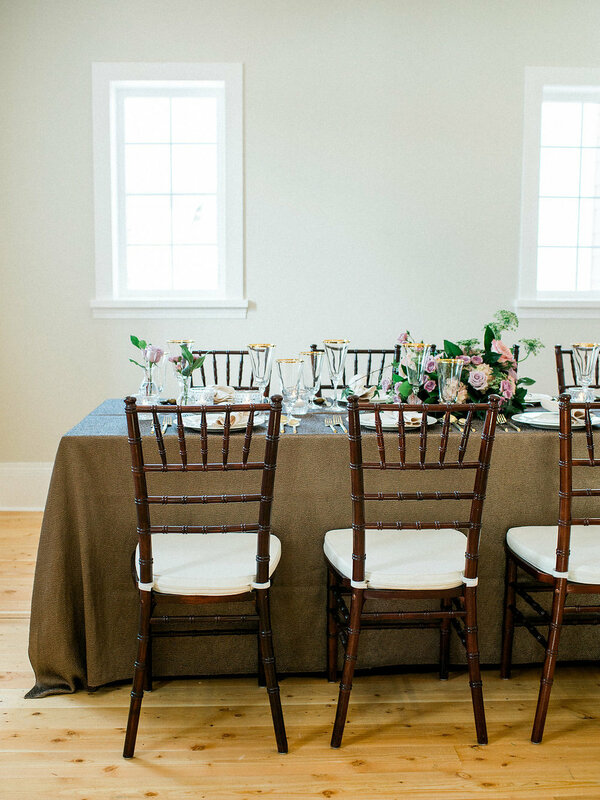 Tedi and Evan are a real-life couple, and they actually work in the wedding industry, too! They own The Picture & The Poet, a dual studio offering both photo and video. 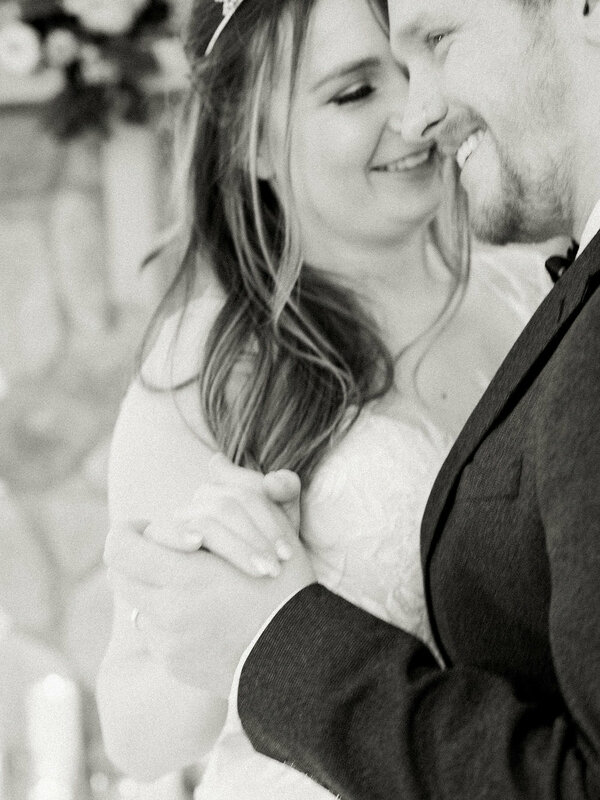 They're so much fun, so if you're looking for some goofy, hilarious people to spend your wedding day with, check out their work. Also, Tedi has THE DAINTIEST HANDS AND WRISTS I HAVE EVER SEEN. I feel like she needs to be hand-modelling professionally. Bridal Bouquet Ingredients: I wanted to keep this one really simple, so that's what I did. 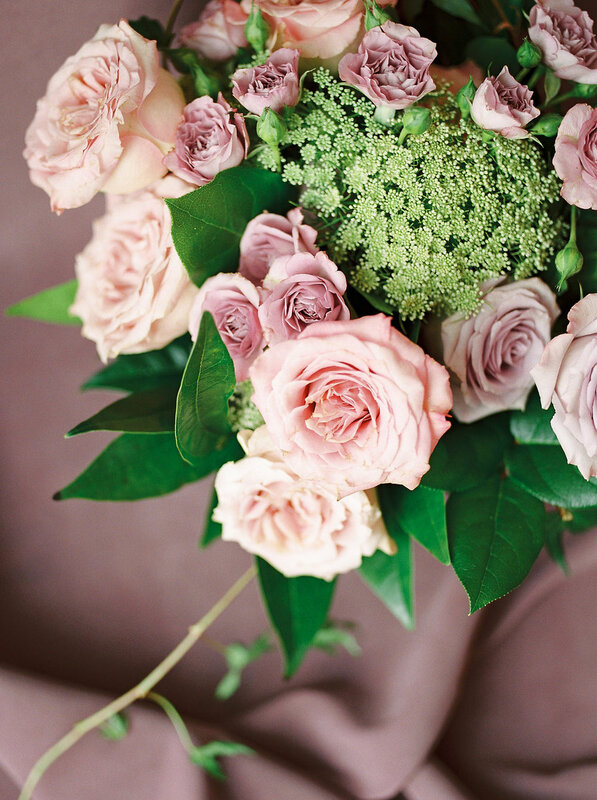 Lavender roses, lavender spray roses, soft pink roses, and Queen Anne's Lace mixed with a few types of greenery. Easy peasy pie. If your venue has a focal point, such as this fireplace at Whitetail, then I HIGHLY recommend using it, and using it well. Allow it to truly be the spotlight that it was designed to be. Here, we've imagined a ceremony taking place in front of it, and then the head table placed in front of it during the reception. 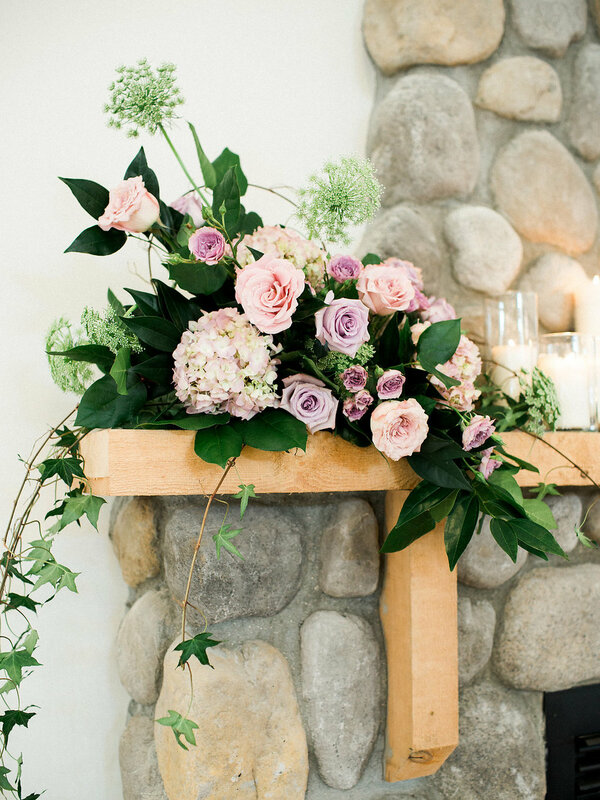 It's a great design, because the mantle is high enough for me to design statement-making florals on the mantle. Below are my initial sketches (super amazing, I know. My next career will be in art fo sho). We kept the guest tables in keeping with the rest of the overall design. While Whitetail has these beautiful wood tables, we decided to add this textured copper linen to create a more elegant base. 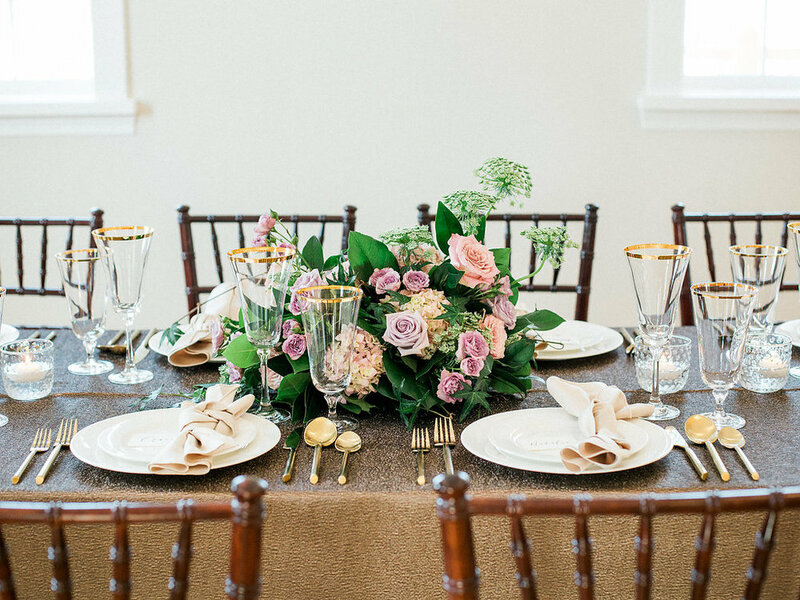 It paired really nicely with the venue's mahogany chivari chairs as well as the gold flatware we got from C&T Rentals. 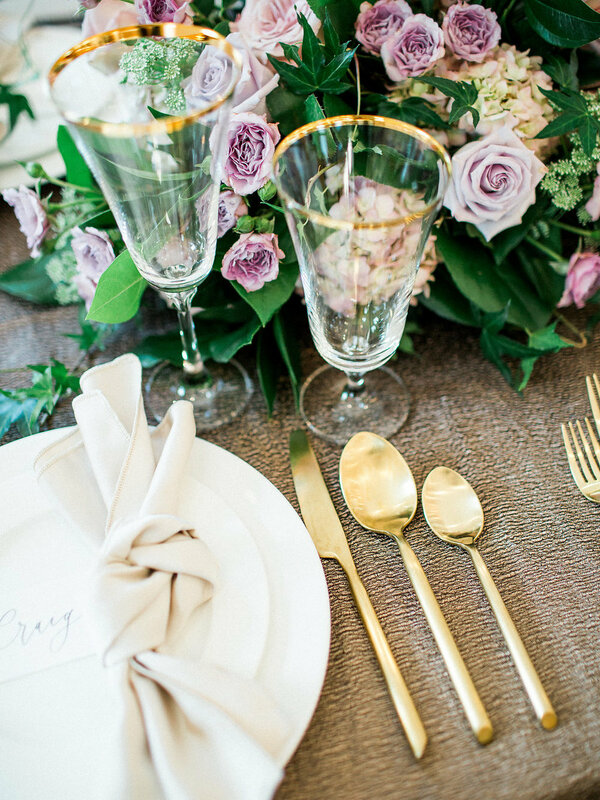 All of the place setting details are from them! One large floral centrepiece was set in the middle of the table, and we clustered candles and stem vases on either end of the tables. Something to note when you're using rectangular tables is to keep in mind the width of the tables - I went a little overboard with the size of the arrangement and would have preferred it to be a little more streamlined. Seriously. Look at how delicate those beautiful little hands are. And that's Tedi's own engagement ring, which they found through Heidi Gibson in LA.